Lajitas, TX –off of Main Street / FM 170 – this is a small town so you can’t miss it. The Equestrian center is on the south side of the road and the RV park is on the north side of the road. Lajitas is approximately 100 miles south of Alpine, TX. From Alpine follow TX 118 South about 80 miles into the Study Butte / Terlingua junction. Turn right on FM 170 and continue 14 miles into Lajitas. You will first see the Equestrian Center on your left (look for the large sign and white fences) and the RV park will be next on the right (before the cemetery), and then the resort is on your left. 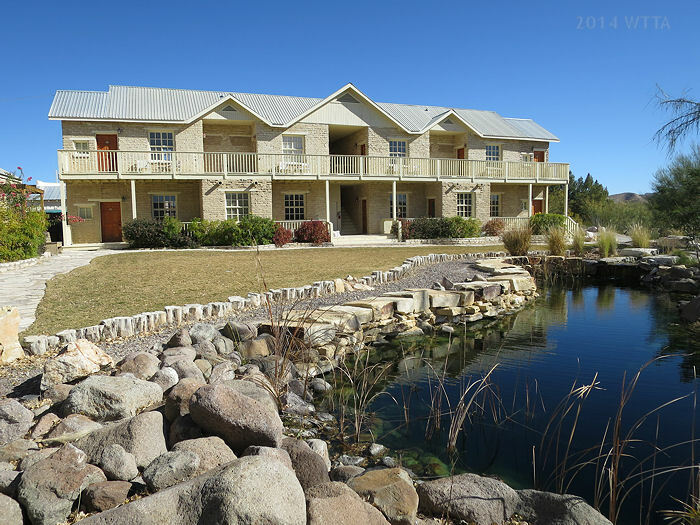 You can board your horses at the Lajitas Equestrian Center and camp overnight at the Maverick RV Park or stay at the Lajitas Resort – all facilities are a part of the Lajitas Golf Resort. 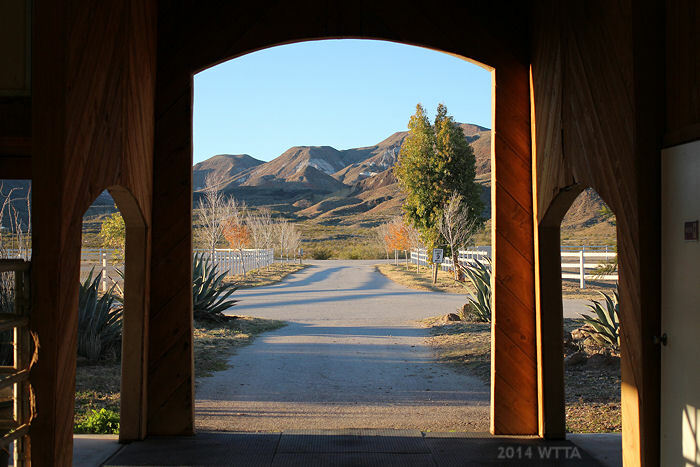 Lajitas Equestrian Center offers boarding to visitors who wish to bring their own horses to ride the trails of Lajitas or ride in Big Bend Ranch State Park. You can board your horse in the barn which offers 12×12 pipe stalls or if space allows you can board your horse in one of their paddocks. The barn is covered, has ceiling fans, and is open on all four sides. 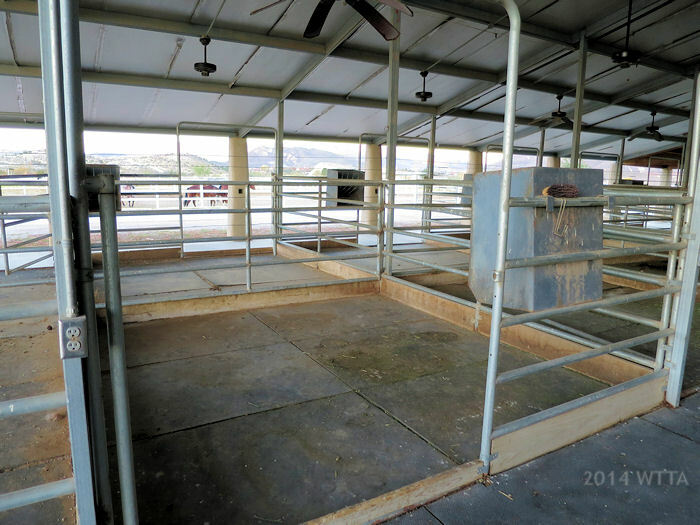 The stalls have rubber mats and metal hay racks hanging on the pipe panels. The barn also has wash racks, a tack room, a bathroom, and an office. Boarders can also make use of the large covered arena (the arena is not lighted) and covered round pen. There is a staff residence at the Equestrian Center which means a staff member is present at the center almost 24 hours a day and they will contact you if there are any concerns about your horse. One of the horses in our group was sun bathing in his stall but staff were concerned that he was possibly colicy – they could not reach us by phone due to the poor cell phone service so the manager, Mark Dial, drove over to our campsite and tracked down the owner. She explained that her horse normally likes to nap during that time of day but to be safe we checked on him and all was fine. It is a good feeling to board your horse at a facility that truly watches out for the horse’s welfare! I was thoroughly impressed. There are extra fees for shavings. You can clean your own stall or pay extra to have staff clean the stall. Next time I visit I’ll pay extra to have my stall cleaned as there was not enough wheel barrows or manure containers which made the job difficult. That is my only complaint about the facility –hopefully they will purchase more wheel barrows. Also be prepared to fill out several forms and releases at arrival when planning to keep your horse here, you might ask ahead of time to have these forms e-mailed over. After a long haul, the last thing you want to deal with is paperwork. You and yours can either camp in your LQ trailer, RV, or tent at the Maverick Ranch RV Park or you can live it up and stay at the Lajitas Resort. Please see the website for details about the resort rooms, as I did not stay there, but I did explore the resort grounds and found them to be beautiful. We stayed at the RV park. The RV park has 30 & 50 AMP / water / septic hookups. You can bring your dogs with you to the RV Park but they must remain on leash. The park has a nice view, especially if you are in the sites furthest to the back towards the east. There is no shade in this RV park. Some sites allow campfires. The community center offers guests a spacious air conditioned / heated area to eat, watch movies, use the restroom, take a long hot shower, or wash your clothes. Behind the club house is a patio and swimming pool. The RV park advertises internet access, Wi-Fi, and cable. At the camp site we occupied, #27, we were unable to obtain these amenities, however, Wi-Fi and internet access was slow but accessible at the community center. Most of the RV sites are pull throughs and spacious, making it easy to park a large rig. Officer’s Quarters – resort rooms, at Lajitas. Pets are allowed at the RV park but must be kept on leash. Unknown if pets are allowed at the resort. Very poor to none depending on where you are in the RV park or at the Equestrian Center. On the trail cell phone coverage is either non-existent or extremely poor. Equestrian Center – $15 a night per stall or $20 a night per paddock – extra charges for using the center’s shavings and having staff clean out your stall. $150 a day for a guide/wrangler to show you the trails. 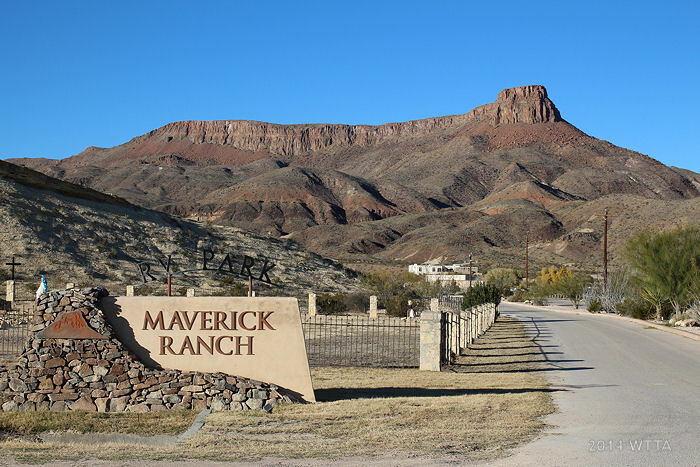 Maverick Ranch RV Park – $39 a night for hookups ($35 a night if you are a state employee, AAA, AARP, or Sam’s Club member). Big Bend Ranch State Park / Barton Warnock Visitor Center – $5 entrance fee & $2 equestrian use fee. If you plan on riding from the Equestrian Center into Big Bend State Park, first check in at the Barton Warnock Visitor Center to show proof of Coggins and pay your state park use fees. We drove over the day before riding into the park to take care of our fees and obtain an entrance permit. You can also get maps, trail advise, hats, t-shirts, etc… at the visitor center. There is no need to trailer out from the Equestrian Center when you can just ride out the front gate. 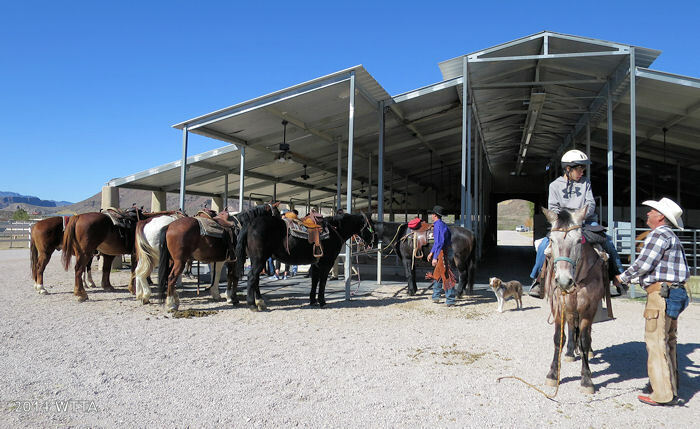 From the Equestrian Center you can easily ride your horse just half a mile to get into Big Bend Ranch State Park accessing miles and miles of trails or you can ride the trails in Lajitas (Lajitas Golf Resort Trail System) which offers approximately 20 miles of trails. 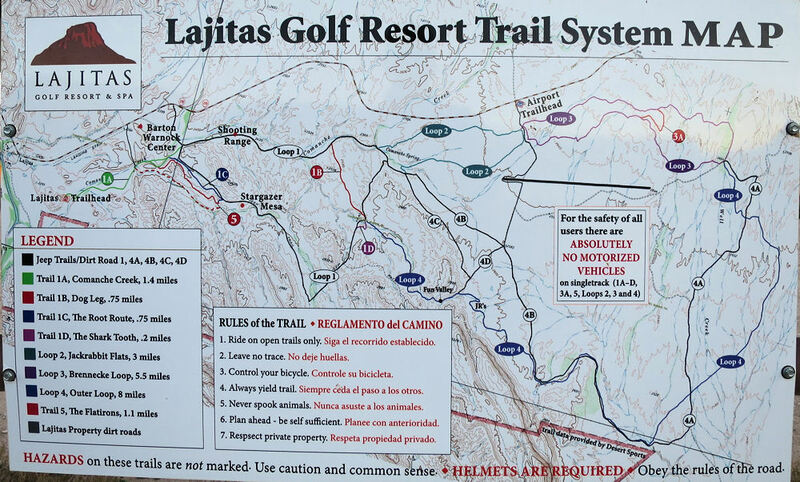 Lajitas Golf Resort Trail System is mainly marked by numbers. The trail markers are infrequent. 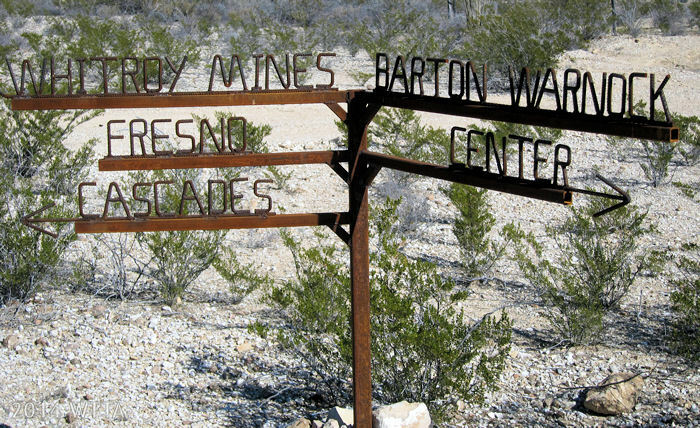 Big Bend Ranch State Park (BBRSP) is mostly marked infrequently with wooden or metal signs. 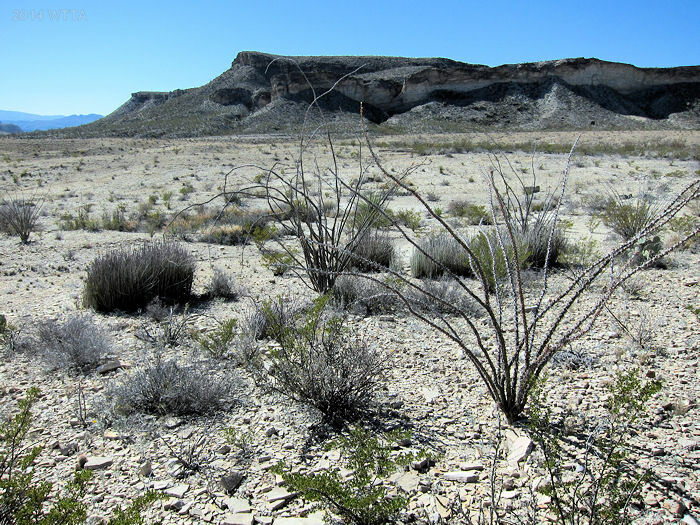 In this region of Texas the ground surface is mostly rocky with some sandy areas mostly found in dry creek beds. Shoes or boots for your horse is highly recommended. The trail difficulty level can vary from easy flat jeep roads to extremely rugged single track trails. Water sources can be scarce as well, so keep this in mind when planning out your route. Pack plenty of water for yourself and if possible some for your horse as well. You can carry a great deal of water in a hydration backpack such as a Camelback or Geigerrig. You may also want to bring area maps, and a collapsible bucket to water your horse with. Due to the remoteness of the land I’d also recommend a dual human/horse first aid kit, rain jacket, hat and/or helmet, flash light, matches, knife, hoof pick, sunblock, and extra food/snacks. I also brought an external charged battery for my i-phone. Cell phone service is poor to non-existent but in a few high areas you can get spotty service plus I had maps down loaded on my iHikeGPS i-phone application that I could access through satellite without cell phone service. Due to the rugged terrain it would also be a good idea to bring an extra horse boot to use if a shoe comes off or if you are using boots on your horse, one could easily become damaged. The trails in this area are shared by hikers, off road bicyclists, and equestrians. Motorized vehicles are also allowed in some areas such as the two track jeep trails. 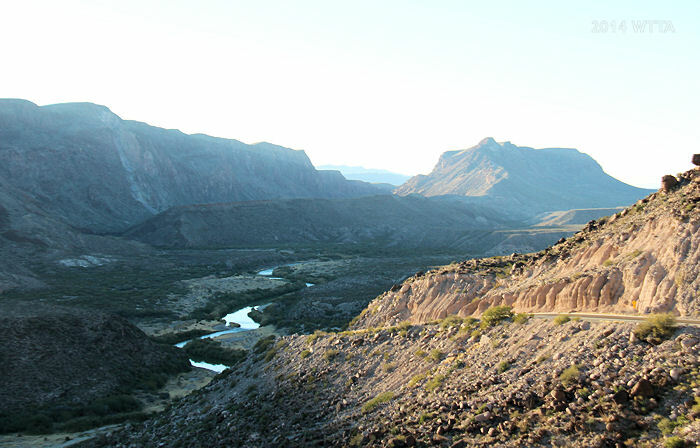 Captivating rugged landscapes called me back to ring in a second New Year in Big Bend country. 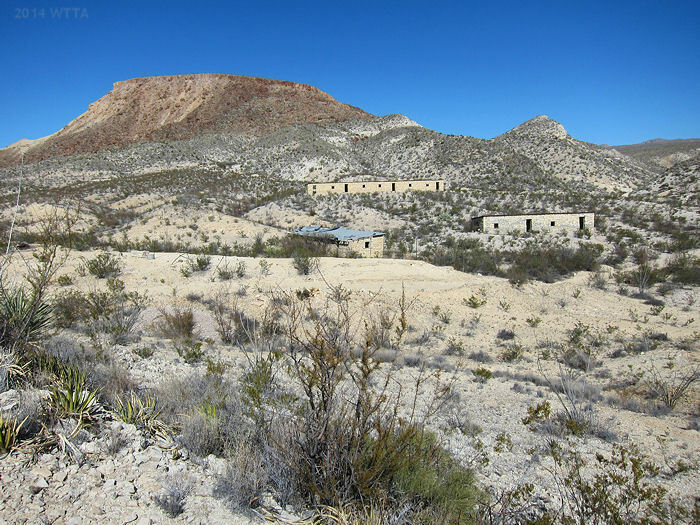 I brought in 2013 by exploring the Big Bend Trails in Big Bend Ranch State Park (BBRSP) at the centrally located Sauceda Headquarters and Bunkhouse. 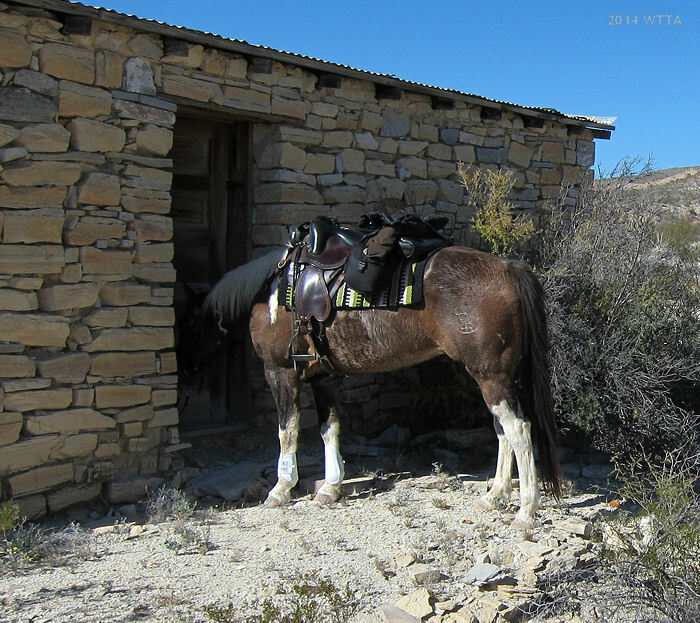 New Year’s 2014 trail riding adventure brought me back to this desolate South Texas land eager to explore remote and rugged territories aboard my sure footed Spanish Mustang/American Indian Horse, Angel. Ringing in the New Year in Big Bend is becoming a tradition for me. This year we went to Lajitas, boarding our horses at the Lajitas Equestrian Center and camping at the Maverick Ranch RV Park. Lajitas provides access to their Golf Resort Trail System and to the south entrance of Big Bend Ranch State Park. 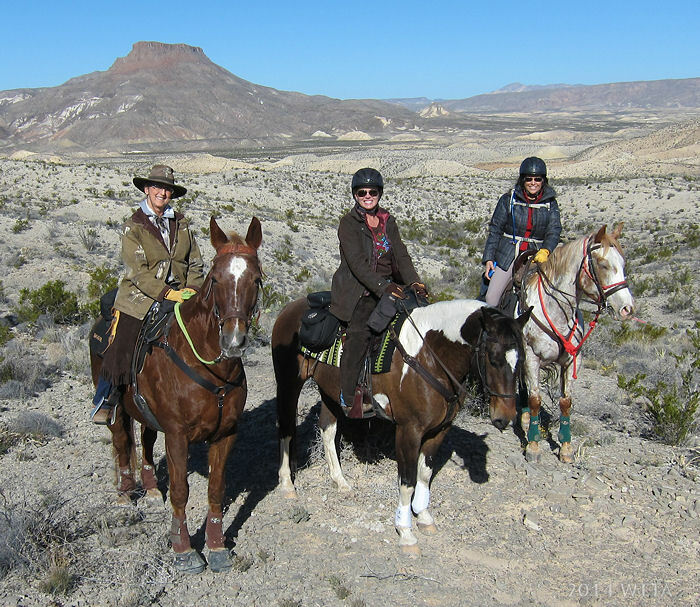 Our small group consisted of myself, my husband, and three of my riding buddies; Carol with her Appaloosa Bug, Beth with her Tennessee Walker Patience, and Haley with her paint Jake. Haley and Beth arrived a day ahead of us and were able to explore the local Lajitas Golf Resort Trail System. The following day they took us out on these trails and I was surprised how many trails branch out of town. This trail system has approximately 20 miles worth of trails, some of which are dirt roads while others are rugged and offer spectacular views. 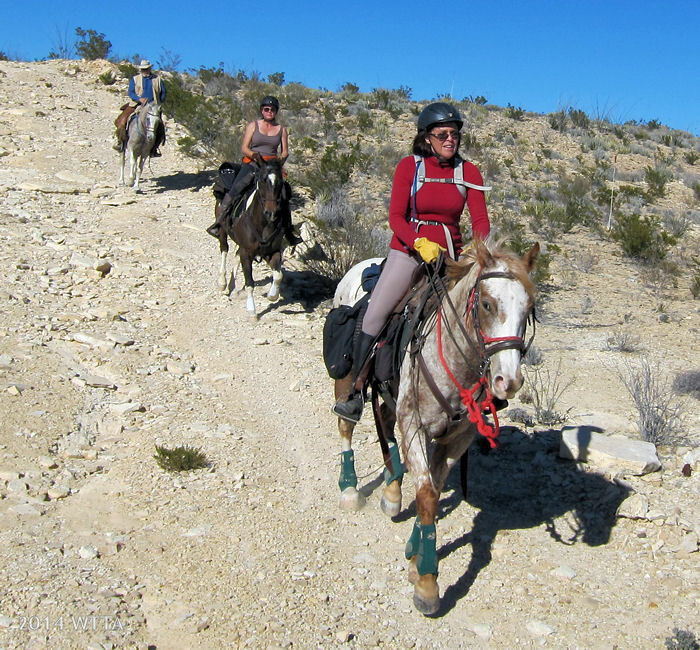 There is no charge for riding this trail system on your own horse. The trail markers are infrequent and if unfamiliar with the area it would not be hard to get turned around. Two days of our stay consisted of exploring this trail system. I did not get to ride each one of the trails, but out of what I did ride my favorite was #5 which climbs up a mesa and follows along the top ridge line providing an amazing view. As far as wildlife goes we did spot what appeared to be big cat tracks, saw a tarantula crossing a gravel road, spotted hawks, mountain goats, and saw signs of Javalinas. The oddest sight was stumbling onto the green of the Lajitas golf course while riding amongst cacti in desert terrain. I could not help but wonder what an amazing amount of water it must take to maintain the turf… an out of place sight no doubt. The Lajitas Equestrian Center has a string of trail horses so if you don’t have your own horse you can still go on a trail ride in this area. They also put on Stargazer Mesa Dinners and overnight rides. Their horses were in good condition and looked to be well cared for. The manager of the center and all “cowboy” activities, Mark Dial, is a knowledgeable equestrian with a strong back ground in AERC, USEF, and also worked as an equine therapist and chiropractor. On New Year’s Eve we celebrated with dinner at La Kiva in Terlingua and enjoyed live music by The Fabulous Vortexans. The food and music was great and the place packed. The drive from Lajitas to Terlingua is not bad. Beth and Haley opted to try the Lajitas Resort New Year’s Eve dinner, steak and shrimp, a bit pricy for us but my friends reported it was well worth it as the food and service was great. On our way home Chris and I were sure we had spotted several unidentified flying objects. Bright orange glowing orbs were slowly ascending into space. I thought maybe they were the Marfa lights. However, when driving into the RV park we got a good laugh after discovering the beautiful floating objects were sky lanterns launched to bring in the New Year by another group of RV visitors. What a sight they were, I’d never seen them before. We did not stay out too late as our big ride into the state park was planned for New Year’s Day. On New Year’s day we planned a trip into Big Bend Ranch State Park and booked a wrangler from the Equestrian Center to guide us. We got lucky to have the manager, Mark Dial, as our wrangler for the day. Mark led us from the Equestrian center into the state park which was an easy half mile ride. From there he took us on a twenty mile round trip journey from the East Contrabando Trailhead to the Whit-Roy Mine Ruins. The day was beautifully clear and started out in the chilly mid-30s but quickly climbed up to a warm mid-70s in the afternoon. We peeled the layers off and the horses were sweaty beneath their furry thick winter hair. There is little to no shade in this land full of cacti, creosote, ocotillo, and sotol. Trees are few and far between in this section of the state park. Mark shared some of the park’s history as we rode along, to include the Wax Factory Laccolith which used Candelilla plants to make wax and old quicksilver (also known as mercury or cinnabar) mines such as the Whit-Roy Mine. The Whit-Roy mine ruins served as a perfect resting spot. Most of this area consisted of old mine ruins and housing for the miners and their families. 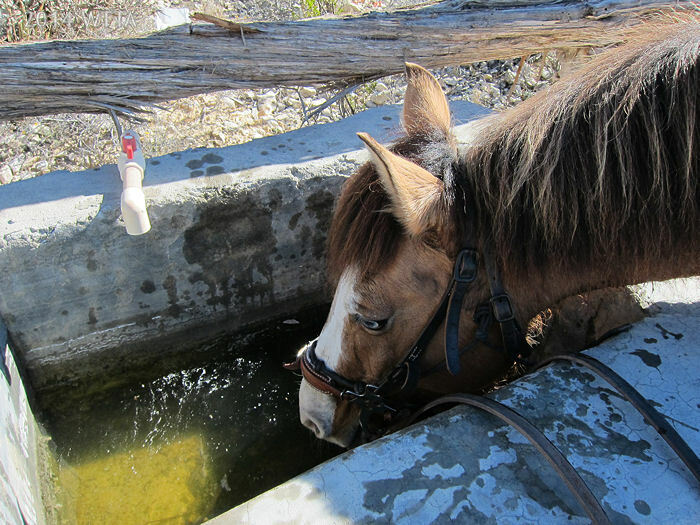 A water trough in the corner of the corral had clean water which the horses were eager to gulp down; this was the first and only water for the horses on our trip in the state park. The creek beds were all dry. The Whit Roy dining hall has been restored along with the outhouse and corral. The quicksilver boom basically dried up in the 1960s and most of the mines were closed. Be sure to stay clear of the actual mine sites, we observed these from a distance, as they are great habitats for rattlers and the ground near the mine is unstable and dangerous. While we finished our packed lunches under the shade of the old dinning hall’s front porch ramada, our horses rehydrated and had a nice rest. Before leaving, Haley hopped off Jake to check out one of the old living quarter mine ruins but Jake wanted to see too, so he poked his head into the doorway. We concluded our Whit-Roy exploring; it was time to head back. After mounting up I took another long look at the old mining town and just a bit further out I saw the huge Wax Factory Laccolith rising out of the land like some crazy foreign object. The most impressive site for me is the Big Bend country itself, God’s unique South Texas creation, nothing is comparable. It is a harsh rugged land for miles and miles, beautifully vast and wild. We set aside a day to drive along the famously beautiful FM 170, also known as El Camino Del Rio. Be prepared to make several stops and have your camera ready to capture roadside photo worthy vistas, such as La Cuesta (The Hill). 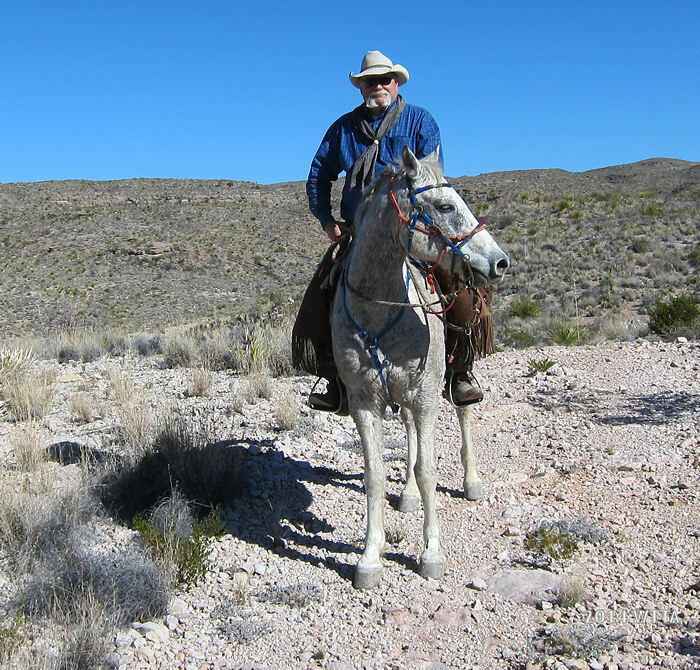 Don’t expect to travel fast, as the FM 170 fifty mile stretch of curves between Lajitas and Presidio has some of the steepest paved grades in Texas, La Cuesta is a 15% grade – I do not recommend this route for hauling horses. La Cuesta is approximately 12 miles west of Lajitas. 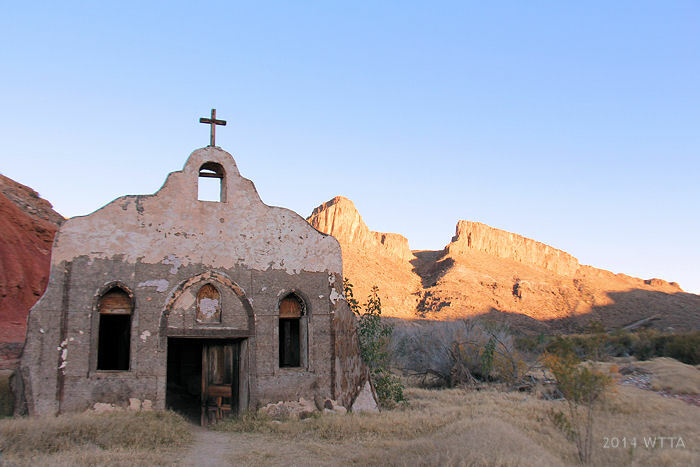 For fans of the Lonesome Dove saga, don’t miss seeing the Contrabando movie set off El Camino Del Rio where scenes from Streets of Larado and Dead Man’s Walk where shot. The eye catching sets sit just off the Rio Grande. Right off FM 170 about half way between Presidio and Lajitas is also Closed Canyon, the hike entrance is just a few minutes’ walk from the road and leads into a 15 foot wide slot Canyon with 150 foot high walls. The Canyon eventually leads into the Rio Grande, but most people turn around before that due to steep drop offs and dangerous terrain. We did not do this hike but I heard the hike to get into the Canyon is easy and the view is worth the effort… next time. Other Activities in Lajitas outside of horseback riding include, golfing, stargazing, hiking, biking, exploring, fishing, rafting the Rio Grande, being pampered at the resort, etc….. There is plenty to do in this area of Texas, above is just a small list of possibilities. I’m looking forward to 2015 New Year’s adventures and expect to be back in Big Bend Country to ring in 2015. 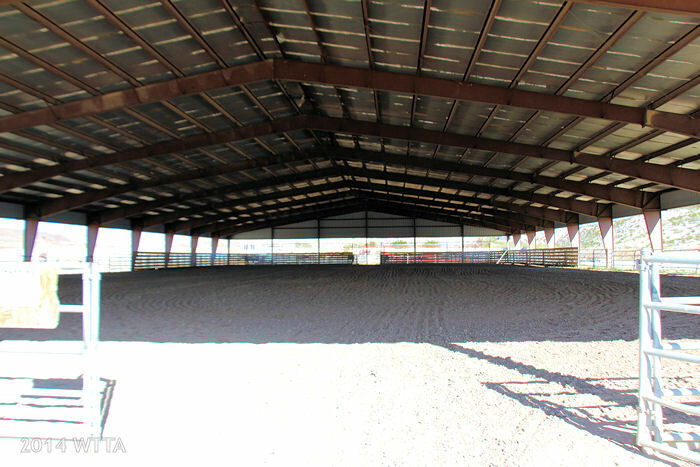 Lajitas Equestrian Center barn stalls. Lajitas Equestrian Center covered arena. 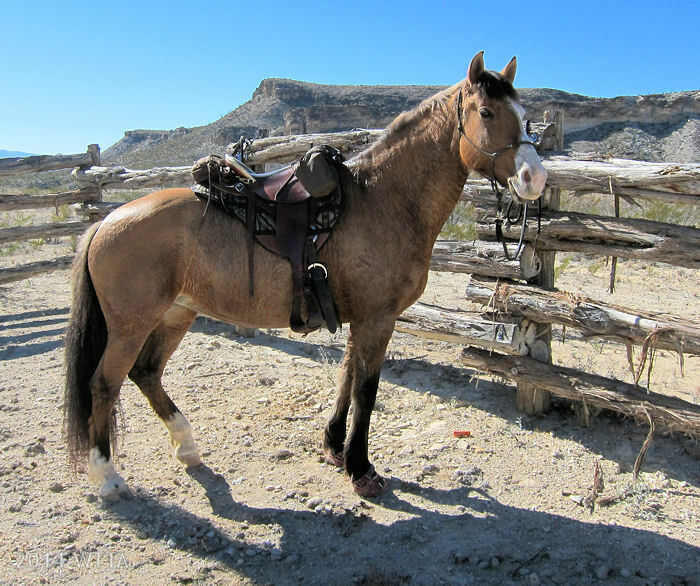 Lajitas Equestrian Center trail horse string – ready to head out. View from inside of the barn.